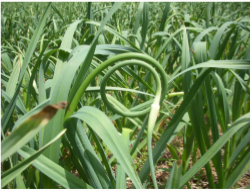 A Killarney Red garlic scape starting its double curl! considered a culinary delicacy in many Asian countries and are increasingly available in the US. gourmet grocery stores or natural food stores. Frozen garlic scapes (called garlic shoots) are readily available year-round in the freezer section of most well-stocked Asian supermarkets. Taste-wise, garlic scapes are garlicky but with a fresh “green” taste. They can be used in any dish where one usually uses garlic but would like a garlic flavor with less bite than garlic cloves. Garlic scapes work well chopped and added raw to salads, salsas, dips, guacamole, marinades, pesto, bean dip, salad dressings, mashed potatoes, and a topping for pizza or baked potatoes. Scapes are also delightful when cooked into sauces, added to soups, stews, omelettes, frittatas, souffles, a stir fry, or mixed into softened butter and used to make toasted garlic bread. Cut into 1-inch sections, lightly steam, and you will think you are eating mild garlickly-flavored green beans. Garlic scapes can also be pickled or added to homemade flavored vinegars. Toss or brush with olive oil and grill along with some fresh Michigan asparagus (they are in season together). A simple, beautiful, and delicious garlic scape spread or dip can be made by chopping some scapes and mixing them with butter, mayonaise, aioli, any white bean dip, cream cheese, or yogurt cheese. Use several scapes under a whole chicken, on top of a large piece of fish, or even a large baking dish of lasagna when in the oven. Add to flower bouquets, as decoration on plates or buffet tables, or even as a fun bracelet! Finally, you can also chop up garlic scapes and store them in the freezer, no blanching required if they have been harvested when young and tender, ready to use all winter long. plastic. However, the season is very short, indeed fleeting. Just like with asparagus, make sure the bottom ends of the scapes you purchase are not “woody”, i.e., check that they are tender enough to be edible and/or to put into a blender or food processor without burning out the motor. So purchase enough of this delicacy now to grill up a large batch of scapes for a special meal, freeze, make pesto, or pickles for a reminder of early summer all year long. Many of our long-time customers purchase 1-5 pounds of scapes during the short time they are available.